This style of custom made signature quilt features bunting flags - which you can hang at your wedding - or you can have the quilt pre-made for display and signing at your wedding, or any other special celebration. 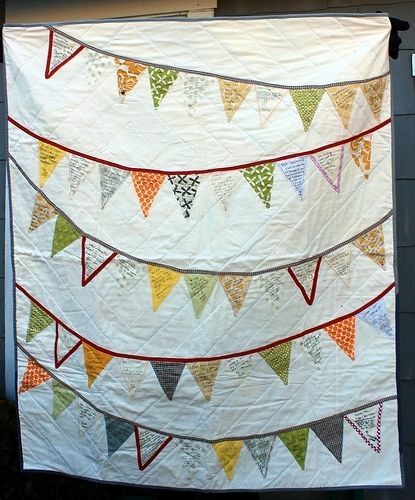 These festive flags can be done in any color or pattern, it's your event and it's your quilt! Pricing varies based on the size of the quilt, the number of the flags, and other customization. You can opt to have a bunting flag kit prepared for your event or have the quilt prepared in advance. These quilts are also perfect for retirement parties, graduation gifts, and other special milestones.